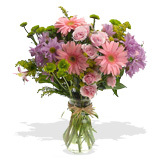 FlowerFresh has a great selection of unique flower bouquets at every price point. We are experts at arranging intensely vibrant color coordinated flower bouquets in a variety of floral design styles. A lily flower bouquet makes for an elegant and sophisticated floral gift, with the added benefit that a Lily flower bouquet may enjoy a vase life of 7-10 days. Lilies symbolize different meanings including, purity and sweetness, virginity and innocence, wealth prosperity and feminine sexuality. A rose flower arrangement is always a popular choice and comes in different price ranges to best suit your needs.